Nationally, about 4.2 million or 14% of Canadians aged 15 years and older reported some use of cannabis products for medical or non-medical use in the past three months. More than half (56%) of the users indicated that they used some form of cannabis "daily" or "weekly." The Government of Canada has tabled legislation to legalize, regulate and restrict access to cannabis for non-medical purposes. In order to monitor cannabis consumption before and after the impending legislative change, Statistics Canada has launched the National Cannabis Survey which will be collected quarterly throughout 2018. Canadians were asked if they thought they would change their behaviour once cannabis is legalized for non-medical use. Regardless of use, over three-quarters (79%) said that they would not be more likely to try or to increase their cannabis consumption. Of the Canadians who did not use cannabis in the past three months, 6% said they would likely try cannabis or increase their consumption. In turn, about a quarter (24%) of current cannabis users said they would likely increase their cannabis consumption after legalization. Nationally, 14% of Canadians aged 15 and older reported having used some form of cannabis in the past three months. 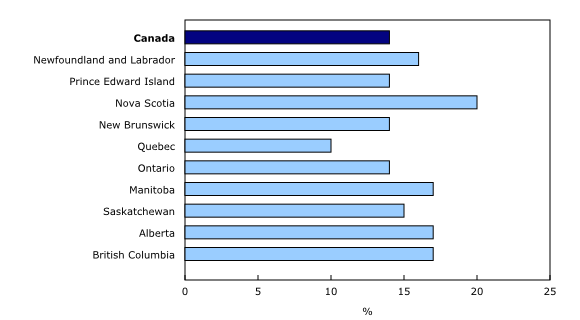 While provincial prevalence of cannabis use in the past three months ranged from 10% in Quebec to 20% in Nova Scotia, none of the provincial variations are statistically different from the national average. Among those who used cannabis in the past three months, almost 40% used it daily, while 30% reported having used it only "once or twice." The remaining group were either "weekly" (17%) or "monthly" (14%) consumers. Prevalence of use generally decreased with age. 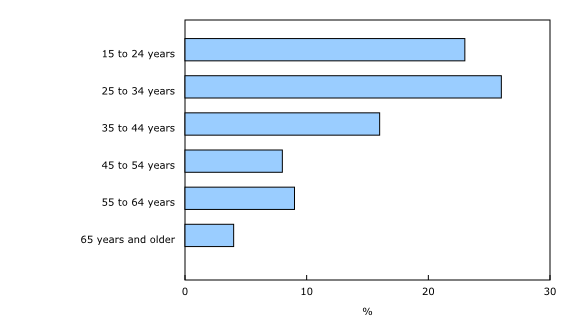 Among individuals aged 15 to 44, prevalence was over 22%, compared with 7% for those aged 45 years and older. Cannabis use over the past three months was 16% among those who identified as males and 12% among those who identified as females. Cannabis consumers were also asked which types of products they used in the past three months. 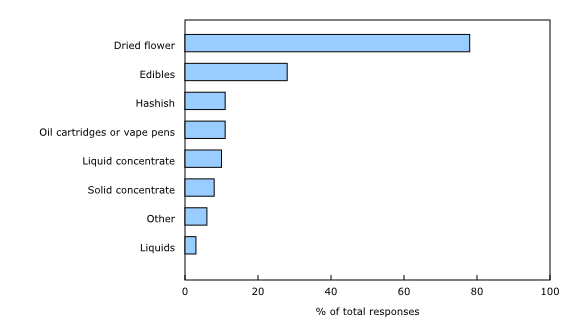 The most commonly used product was dried flowers (78%), followed by edibles (28%) and hashish (11%). Cannabis users tend to obtain their cannabis products from someone they know. Multiple responses were permitted and 31% reported obtaining the cannabis they used from a family member or friend, while 22% reported sharing among a group of friends. 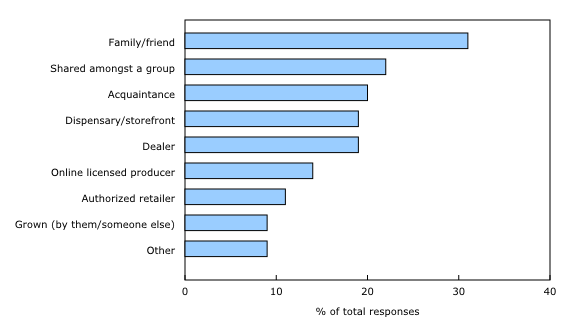 One in five reported obtaining their cannabis from either a dealer (19%), storefront (19%) or acquaintance (20%). One in seven (14%) reported obtaining the cannabis they consumed through an online licensed producer, while 9% of cannabis users grew the product themselves or had someone else grow it for them. There can be more than one source from which cannabis product is obtained. However, 72% of the cannabis consumers reported having obtained their product from a single source. When asked if their purchasing behaviours might change with the legalization of cannabis, half of the consumers said they would change their source of supply. Canadians who used cannabis in the past three months were also asked if they had consumed cannabis within two hours of driving. Among the cannabis users with a valid driver's licence, 14% said they had driven within two hours of use. This proportion increased to 23% for drivers who were daily or weekly consumers of cannabis. 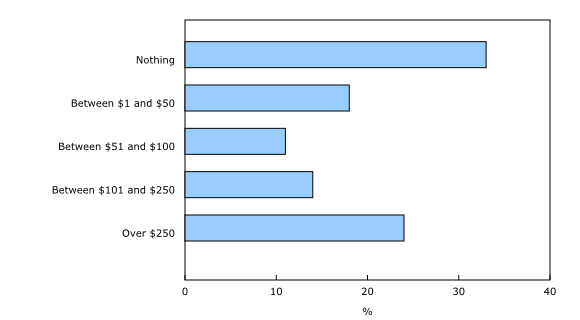 When asked how much they spent on cannabis over the past three months, one-third of cannabis consumers reported that they did not spend anything on the product they consumed. This figure corresponds with the fact that almost one-third of consumers reported they obtained their cannabis from friends or family. Almost one in four cannabis users reported spending more than $250 over the past three months. This survey falls under the new 'Rapid Stats' program being offered in the Special Surveys Division, within Statistics Canada, to rapidly respond to pressing data needs. The main objective of the NCS was to focus on the level of cannabis use in the past three months, and the likelihood that respondents may change their behaviour if the use of cannabis for non-medical purposes is legalized in 2018. The data were collected from every province in February and March 2018. The target population for the survey is non-institutionalized persons 15 years of age and older, living in one of Canada's ten provinces. These data complement previous releases in December 2017 and in January, February and March 2018. For more information regarding cannabis statistics, please consult the Statistics Canada Cannabis Hub. A future release, entitled "Association between the frequency of cannabis use and selected social indicators," is planned for May 2018. The infographic "National Cannabis Survey, quarter 1, 2018," which is part of Statistics Canada — Infographics (Catalogue number11-627-M), is now available.